Today in Masonic History James Thomas Blair, Jr. passes away in 1962. James Thomas Blair, Jr. was an American politician and lawyer. Blair was born on March 16th, 1902 in Maysville, Missouri. He attended Jefferson City, Missouri Schools as well as the Staunton Military Academy. He would attend Southwest Missouri State Teachers College (now Missouri State University), the University of Missouri and would receive his law degree form Cumberland University in Tennessee in 1924. In 1925, Blair first entered politics. He would win the election for city attorney of Jefferson City, Missouri. In 1928, Blair would win the election for a seat in the Missouri House of Representatives. He would serve two terms prior to the outbreak of World War II. During World War II Blair served in the United States Army Air Forces in Europe. Blair would receive the Air Medal for meritorious service in aerial flight, the Legion of Merit one of two awards issued as neck orders (the other being the Medal of Honor) and the Bronze Star. Blair would rise to the rank of Lieutenant Colonel during World War II. After Blair's return from World War II, in 1947, he would resume his political career when he was elected the Mayor of Jefferson City. The post would be short lived though, in 1948 he would be elected Lieutenant Governor of Missouri. He would serve as Lieutenant Governor until 1956, when he was elected Governor of Missouri. 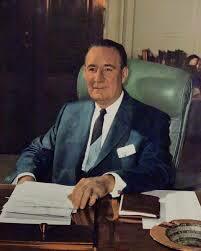 By law Blair was able to only serve one term as Governor he would leave office in 1961. During his term Blair was known as a Civil Rights Advocate. In a speech to the General Assembly in Missouri he was quoted as saying "Always and everywhere I will identify myself with any victim of oppression or discrimination...and I will support him." This helped Missouri form the Commission on Human Rights in 1957. Among Blair's other accomplishments as Governor were the first budget review and control office was established, a nursing home licensing law, establishment of a Higher Education Council, expansion of the Missouri Highway Patrol, the setting of speed limits and the establishment of a Missouri state employees pension fund. During Blair's term as Governor he was an advocate of Welfare reform and of providing health insurance to the disabled. Tragically, Blair's retirement after being Governor was short lived. Blair and his wife were found dead in their home July 12, 1962. Police believed that a car accidentally left running in the garage filled the air conditioning system in the house and the couple died of carbon monoxide poisoning. Blair was a member of Jefferson Lodge No. 43 in Jefferson City, Missouri. He was raised in that lodge October 14th, 1925.